Due to the colonisation of Africa back in the days, the map of this beautiful continent is peculiar. The Caprivi Strip however is even more bizarre. A small rectangular shaped piece of land bordering Angola, Botswana and Zambia and touching Zimbabwe. The last couple of centuries this has been a strategic part of Africa and the strip itself was owned by Germany, the UK and South Africa before Namibia finally got its independence. 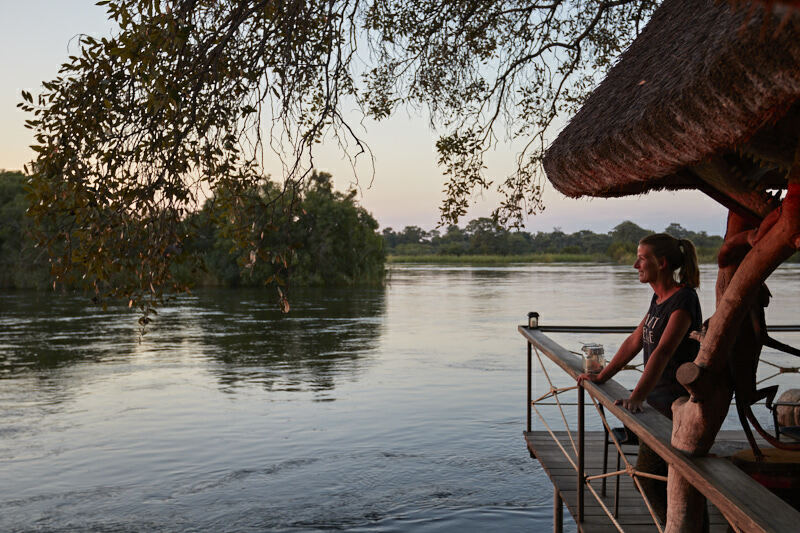 Since the name Caprivi Strip originated from the German occupancy they’ve changed the name to the Kavango West & East and Zambezi Region. The most common way to get to the Caprivi Strip is out of Grootfontein. You’ll take the B8 which is a long (and a bit boring) road to the north. The more north you drive the more poverty you’re likely to encounter. There are huts next to the road and cows, goats and donkeys on the road. So do take care when driving here. A nice first stop is the town of Rundu. 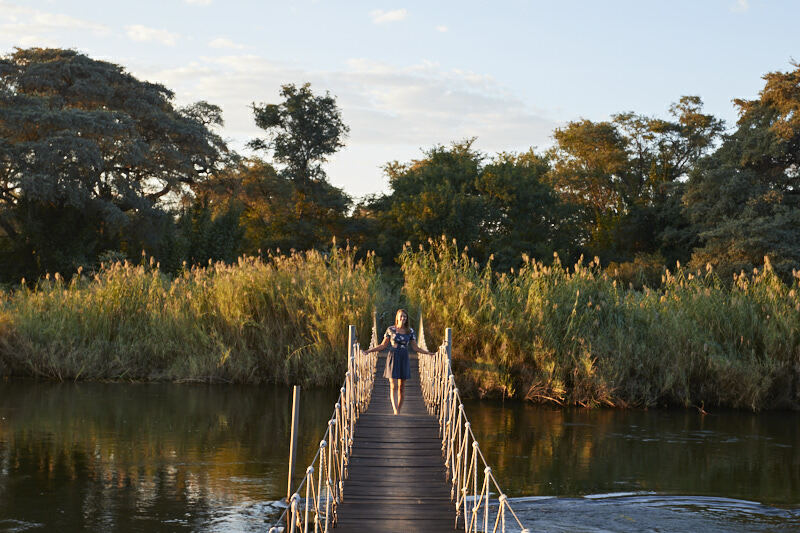 Here you’ll have a magnificent view on the Kwando River. We had a drink at the Kavango River Lodge. I wouldn’t want to stay here but the view on the river is beautiful. Leaving Rundu you’ll head East towards Kavango West & East. After being in these sandy Namibian places it’s a welcome change: being able to spend some nights next to a river. 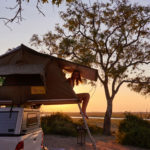 Luckily there are plenty of great places to stay in the Caprivi Strip. This self-catering lies 175 kilometer east of Rundu and has got 5 chalets. We decided to camp on of their six amazing campsites. Each place has got its own kitchen and shower. 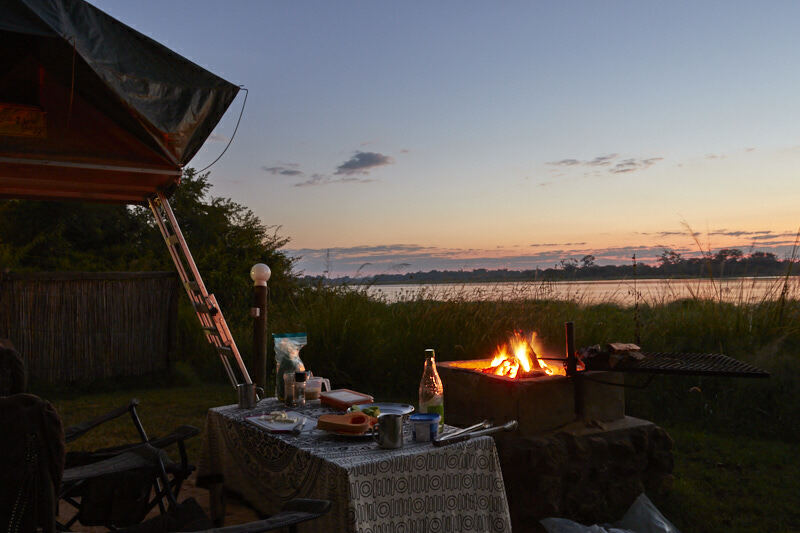 There is also a bar on the small island in the Okavango river. For this, you need to cross a long hanging bridge over a fast flowing river that can only be used by one person at a time. After passing the bridge you cross the island to the other side where there is a bar that opens just before sunset. There are signs everywhere that you need to watch out for hippos, crocodiles and snakes but are then rewarded with an ice cold red wine at sunset. A bit more the east there is the Nunda River Lodge. Nunda is a bit bigger and seems to be focused on families and groups. This does mean that there is a lovely swimming pool, a big deck overlooking the river and a small restaurant. Some campsites are even closer to the water than at Mobola. We literally pitched our tent two meters from the water! 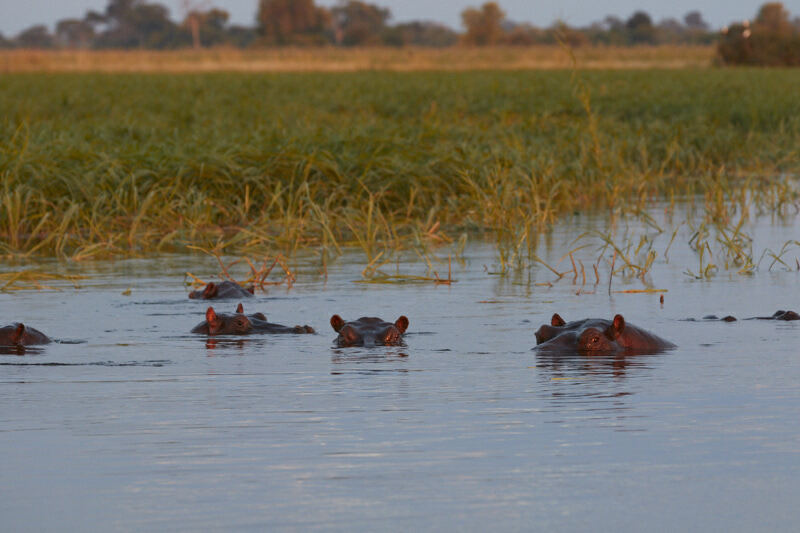 The hippos passed our tent at about five meters at night. 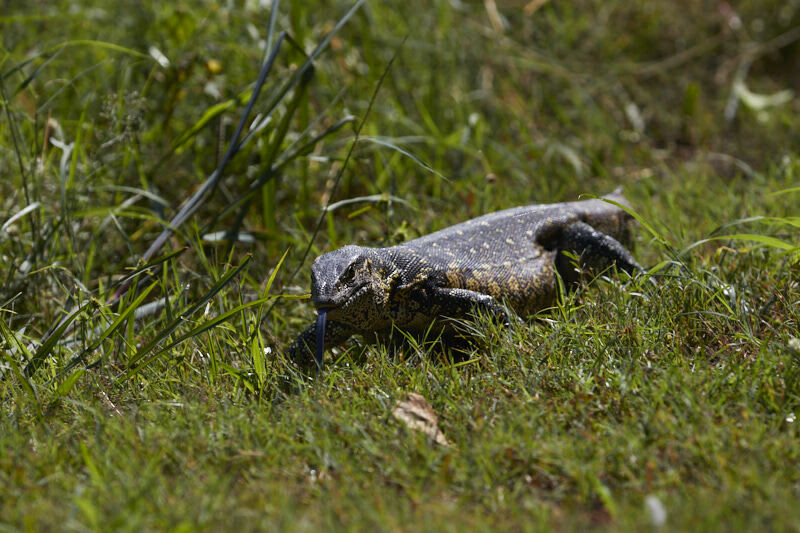 A ‘water monitor’ visited us as well. How cool is that! This lodge is just as pretty as the other ones and also situated along the river. They even made a swimming pool in the river and has a bit more of a hipster/backpackers vibe. 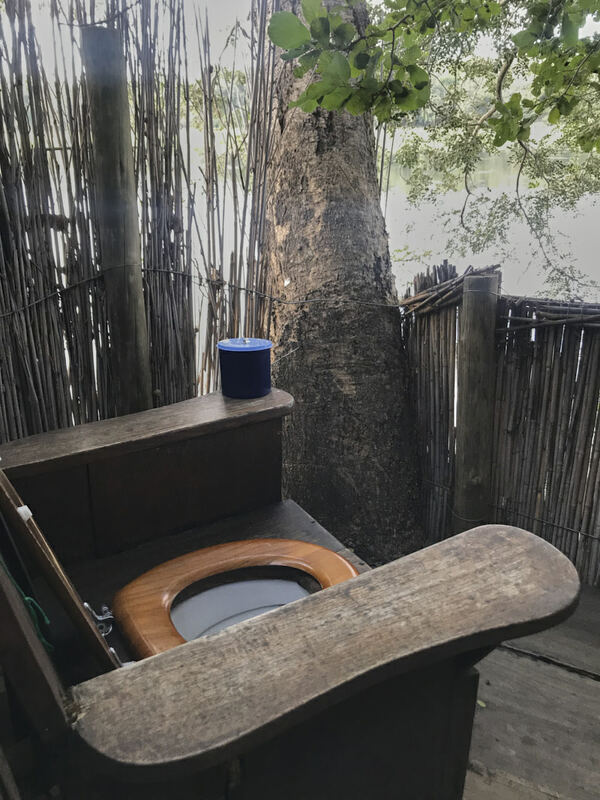 The toilet is built on a ‘thrown’ with a view on the river, a bath is built in a tree house with that same wonderful view and a great chef in the restaurant: it’s all there. It’s also possible to spend a night in one of their chalets or tree houses along the river. You should definitely make a boat trip on the river at one of these lodges. It’s such a wonderful region. 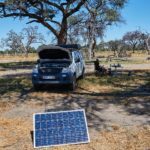 Of course you don’t travel all the way to the Kavango and Zambezi Region to stay in a lodge or campsite. 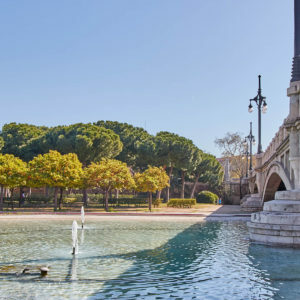 Be sure to check out one of the following special parks. 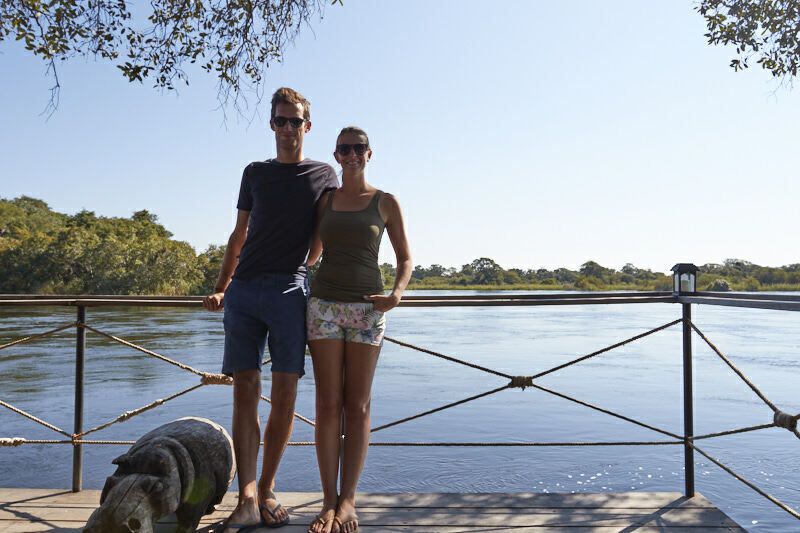 The Mahango National Park shares its border with Botswana and the Okavango River. With the river flowing here you definitely have to take the eastern loop within the park. 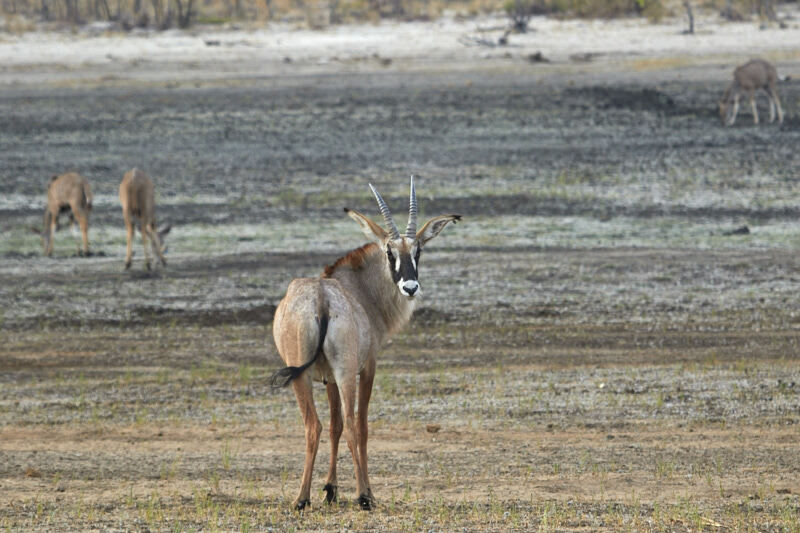 You’ll have a chance of spotting the Red Lechwe and the Sable Antelope one of the flood plains. Birders will have a great time in this park as well. More bird species can be found in the park than anywhere else in Namibia. Mudumu is one of the bigger parks in the region and is known for its riverine forest along the Kwando river. There are plenty of animals to be found here. How about the roan and sable antelope? Or the special sitatunga and lechwe? Chances are that you’ll find big herds of elephants and buffalos as well. You do need a 4×4 for this park since the roads aren’t that great and they’re poorly marked. It does have everything for an adventurous afternoon drive. You can get a map at the reception of the park. A less adventurous park is Bwabwata National Park since you’re literally driving through it when you’re on your way to (or coming from) Botswana. 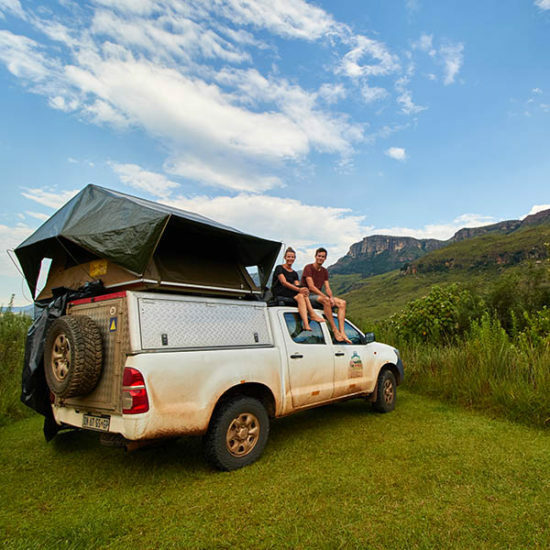 Wildlife numbers are improving and with new developments in terms of lodges and campsites coming up it’s a promising area to visit. If you just want to drive through the park you don’t need a permit. 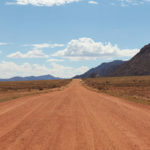 If you want to wander off the main road you can get a permit in Buffalo (western section) or Susuwe (eastern section). One of the smaller parks is the Nkasa Rupara National park. 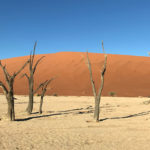 This park consists of two large islands called Nkasa en Lupala (also known as Rupara hence the name of the park) and borders the well known Linyanti region in Botswana. The sitatunga, red lechwe and puku are common inhabitants of this park. It can be quite a challenge to get to the park. Even with a bit of rain, a vast area of the park is flooded. The roads are improving however and with the development of new bridges, accessibility is getting better and better. 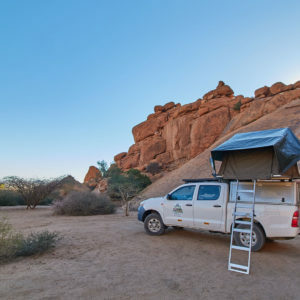 Did you manage to see everything you want to in Namibia? At least you’re perfectly situated for a visit to one of the neighboring countries!